If you've been reading articles from naturallycurly.com for a while, are immersed in the natural hair world, are a person who appreciates intricate and stunning hairstyles, or were a fan of Jada Pinkett Smiths character in the Matrix (hopefully this is all of you by now), you have probably heard of the term Bantu knots. While this hairstyle is often worn as a protective hairstyle or as no-heat stretched out style, the history of the word and its long-standing tradition in Black and African culture makes it much more than a cyclical fashion trend. Before the style became the central argument among those condemning cultural appropriation and before they donned the heads of celebrities like Rihanna and Scary Spice (Mel B), and "Crazy Eyes" from Orange is the New Black, they were a hairstyle with a history as interesting as those still rocking the style today. Ready for a history lesson? Don't worry there won't be a pop quiz at the end, but I do hope you learn something. Origin: What does Bantu mean? Bantu knots are a traditional African hairstyle that has been around for over 100 years. "Bantu" is a comprehensive term used to describe the 300 to 600 ethnic groups within southern Africa that spoke the Bantu language, according to the South Africa History Organization (SAHO). However, it is important to mention that Bantu speaking people are not a homogeneous group. In fact, SAHO discloses that there are over 100 million people speaking variations of the Bantu language in southern and central Africa who speak about 700 languages, including several dialects. Interestingly though, across these regions "Abantu" (or Bantu as used by colonists) is recognized as the Zulu word for people in most languages. "It is the plural of the word 'umuntu', meaning 'person', and is based on the stem '--ntu' plus the plural prefix 'aba'." Exactly how these languages made their way into southern Africa remains unclear and debated, however it is documented that the forbears of Bantu speakers achieved incredible cultural developments and built beautiful fortresses that are still around today, including the Zimbabwe Ruins. Unfortunately, colonists later ransacked the countries for natural resources and many of what the Bantu people built were either destroyed or abandoned and slowly dissipated. Colonists first discovered Bantu-speakers in the 16th century, and by the 1960s', Bantu replaced the term "native" in official government usage in South Africa. The name held many emotive meanings as it was co-opted and used heavily during the Apartheid, and many Africans began to despise the term. Eventually, Bantu was replaced by Black, and Bantu returned to its original meaning in reference to Bantu languages. Today the hairstyle has been reinvented in several ways, and still remains a staple for Black women around the world, especially those wearing their hair in natural styles. They are worn by African women of certain cultural groups with a sense of pride and are a strong representation of women in the community wearing a natural hairstyle passed down from generation to generation. Although many African-Americans do not know where their roots lie in Africa, it's an amazing feat that we have been able to keep this tradition and style alive in our communities and families today. Of course, as happens with Black culture too often in the fashion industry, the hairstyle has been used on runways of almost exclusively white models, on non-Black celebrities, has been renamed "twisted mini buns," and magazines have even given credit to these non-Black people as inventors of the style or listed it as a 'new' trend (Side eyes Kardashian and Jenner clan.) In fact, there are many people today who still see Bjork as the person who brought the style back in the 90s. The issue with this lack of credit to the Black community is simple and Ebony magazine called it 'columbusing' in reference to magazines giving credit to the wrong people. This essentially means that a white person attempts to take credit for discovering something that already existed, thereby removing said thing from its roots and its cultural significance to the community that actually discovered it. Cultural appropriation is particularly threatening with regard to Black hair because Black women have had to fight for equal representations in several industries and for our beauty to be valued by society. Often times when Black women have worn traditionally Black hairstyles it is written off as 'unprofessional' or 'ghetto,' but when white women do it, suddenly it's fashionable or a 'new' trend. How can you rock Bantu knots? 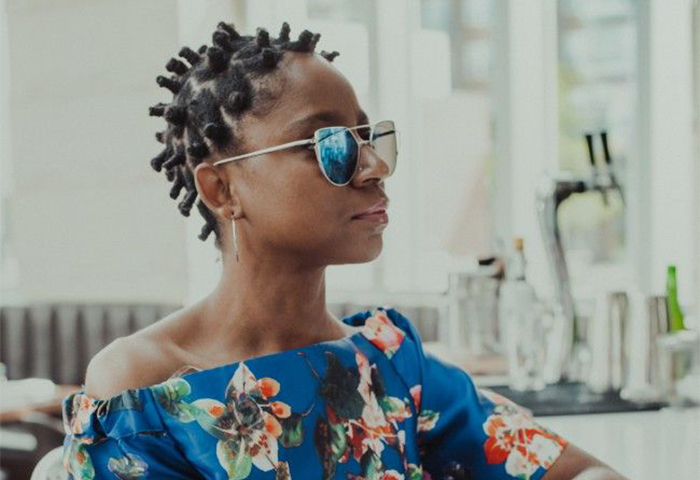 The simple and stunning look is a favorite non-installation protective style worn by many Black women, including our Senior Copy Editor Gerilyn Hayes (pictured). They are made by twisting your hair around itself until it forms a knot that resembles a stack of tires. It is used as protective style for both natural and relaxed hair and is commonly used in overnight routines to preserve longer lasting and more defined curly styles. "Bantu knots are my favorite non-installation protective hairstyle. I love wearing them because they keep my ends protected from potential breakage, and they help me feel fierce!" Click here for more info on the style and a tutorial. Can you wear Bantu knots if you are not Black? I can't answer that, but I do advise that before trying on other peoples culture that you understand and appreciate the importance of what you are trying on, acknowledge its history, recognize the social implications that belong to the tradition, and vocally and physically support the people affected by those social implications. If that doesn't make sense to you and you are not Black, then I would skip the hairstyle altogether and stick to complimenting the women who wear it. Where did you first learn about Bantu knots? Have you worn them before? Share in the comments below!